Heat the oven to 180C/fan 170C/gas 4. Slice the aubergines longways and with a sharp knife, score the flesh in a criss-cross pattern. To make the marinade, mix together the res el hanout, honey and oil, and season with salt and pepper. Place the aubergines cut-side up in a roasting tin and spoon over the marinade. Roast in the oven for 15 to 20 minutes or until tender and caramelised. In the meantime, cook the spelt according to packet instructions. 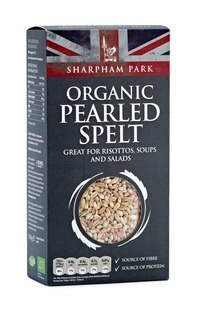 Place the pearled spelt in a saucepan, cover with water and add a pinch of salt. Bring to the boil over a medium heat, then turn down the heat to low and cook for approximately 10 minutes until just tender. Drain off any excess moisture, then leave to cool while the aubergine finishes cooking. When the aubergine is cooked, remove from the oven and allow to cool slightly. Peel and cut the orange into segments and thinly slice the radishes. Prepare to assemble the salad by placing the rocket in a large bowl. Scatter over the spelt, orange and radish slices before topping with the warm aubergine. Spoon out any remaining marinade from the baking dish and drizzle over the salad - stir through a little oil if it requires loosening. 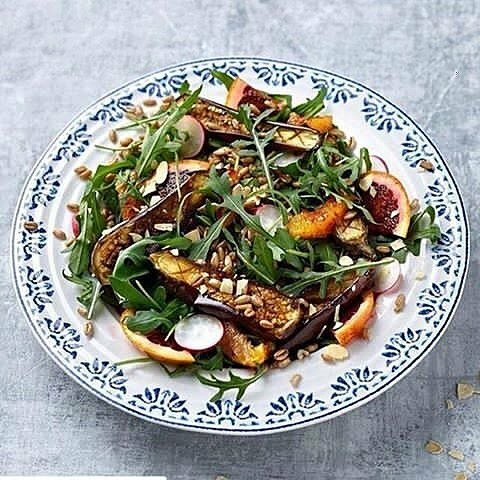 Finish the salad with a sprinkling of toasted almonds.